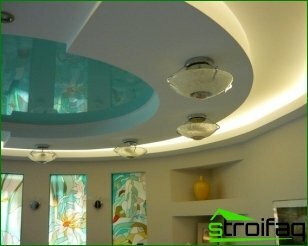 In the last article we discussed the use of ceiling lighting. Continuing the theme, let's talk about the principles of zoning bathroom space with the help of lighting fixtures. Lighting in the bathroom photo It will help you to imagine the final appearance of the interior. Like the other rooms of the apartment, bathroomIt involves zoning space. Thus, for example, will never be more than the allocation of function space near the mirror. If the bathroom has special podiums or niche, why not identify them and? 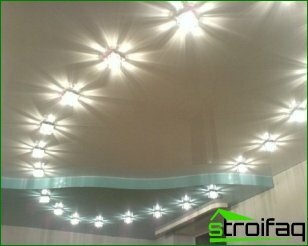 Will help you in this downlights. This area is used quite brightlight sources, is expected of them that they will not be sent to the eyes, and will not dazzle. The best kind of illumination - diffused. 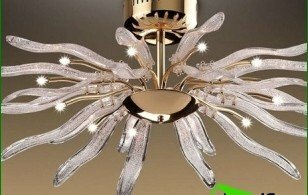 For this purpose use is preferably lampshade, for making which may be used matte or white plastic. The use of white lighting makes quite predictable, so it is best to avoid experimenting with other colors. 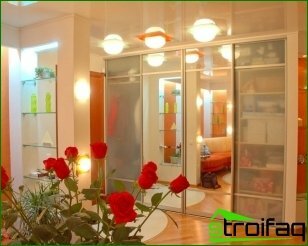 If the mirror is wide enough, then foruniform lighting fixtures are installed along it at an appropriate height. Isolation light mirror may be performed in various ways. Often, it uses two lamps, which are located symmetrically to each other. Thanks to them, provided evenness of light and there are no shadows. If the size of the mirror rather big, you canconsider the location of fixtures option on its perimeter. 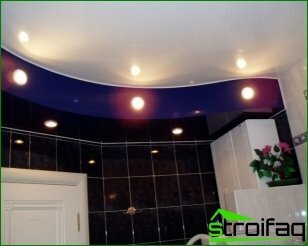 To highlight this element bathroom can use lamps of different types: LED, halogen, fluorescent and incandescent lamps. Whatever you do not use light bulbs, try to get the most of natural light. Fix the lamp you can on the surfacewall or directly on the mirror. 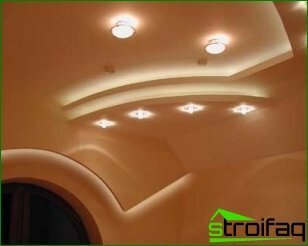 It is not necessary to drill a smooth surface, some illumination devices just stick to it. Often taking a bath - it is not just an opportunitywash. We can get endless pleasure from it. To increase the pleasure pastime, can be equipped with this accessory plumbing autonomous backlight. Let's look at how space zoning. You can use lamps with colored glass. When used with a colorless lamp operation mode in the two positions can be set just two lamps that differ in color. They may be included separately from each other. Some take a decision on the allocation of the bath area through a directional light that creates the twilight in the remaining space. If your bathroom is large enough, andceilings in her low, then the fixtures can be grouped into specific sectors. This allows you to get the effect of zoning spaces that are painted in different colors and smooth flow from one to another. Some want to get a delicious lighting above the water surface. You can use a floor lamp with a two-meter rack. Bathroom Lighting room photo will highlight any item and sanitaryposition the lamp over him. Well, when your every action has a certain functional load. When you install the shower enclosure is important to worry about the presence in it of autonomous lighting. To create in the bathroom a special mood,Use decorative outdoor lighting. To illuminate the floor, you can use high-strength and sealed lamps, which were designed to illuminate the garden paths. They use the lamp power does not exceed 5 watts.